This morning between 10:00 a.m. and noon I attended a healthcare rally. It was a little bit different than your standard protest. Rather than standing in one spot, groups of us were assembled on all four corners of Route 64 and Randall Road in St Charles, and when we had walk signals several of us would cross to another corner. The ability to keep moving was an advantage in keeping our energy up, and in making sure those in cars stopped for the light got a good look at our signs, but it also helped to keep us warm. I had a lot of layers of clothes on, topped with my longest and warmest coat, two hats, two pairs of gloves, and was still freezing. 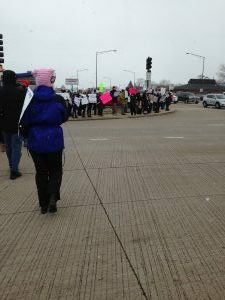 I really think the fact that a couple of hundred of his constituents would spend their Saturday morning freezing to try to a message across would give Randy Hultgren pause for thought. It was nice to see news crews from the Chicago stations, and photographers from local papers there, but I think the most encouraging part were the honks of support from passing motorists. They were constant. And I had not previously considered whether the majority of truckers were ACA supporters. Now I’m convinced of it. 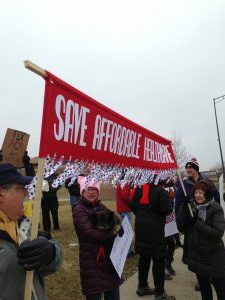 Today’s healthcare rally was planned by Indivisible Illinois Congressional District 14…I think. I say that because there are so many of these groups mushrooming up that when I attended a meeting for Indivisible Fox Valley last week there were people there from two other groups and at one point we were discussing coordinating between the groups and it was decided that someone would first have to make a chart to figure them all out. And all of the groups I’m aware of have future rallies and protests planned. All of them. I’ve named just two of the groups that I’ve interacted with in this post, but I know there are more, and I keep running into people I know, but not from any previous political effort of mine. Today I ran into a former co-worker. Last week I dog-sat for my downstairs neighbor so she could go to a rally at Trump’s place in Chicago. I really don’t think these Republican constituent dodgers have any idea what they are up against. Their bubbles are thick indeed. Not that long ago I wrote about my Congressman’s attempts to kill me. Since then I’ve joined in an ongoing game of “Where’s Randy?” with many — oh, so many — of my fellow residents of IL-14. We’ve been calling his office, we’ve been visiting his office, we’ve been relentlessly commenting on his Facebook page with several concerns, but one unified message: When’s your town hall Randy? Yes indeed, please do take a look at the soon to be former Congressman Randy Hultgren reading cherry-picked letters and spouting vague talking points. When you’re done with that, and if you are at all near the Chicagoland area, please do clear your calendar for this event on the afternoon of March 3. Guess Randy will be back from Africa by then. We are working on a way to, er, greet Randy appropriately without disrupting this event for the Veterans attending, so if you think you can make it, please say so in a comment, or message me and I’ll respond with information about that. Meanwhile, beyond spreading word of Randy’s cowardice I’m at a loss for how to get him to face his constituents, so any suggestions would be welcome. What do all the following have in common? Answer: They all were opposed by Republicans in Congress. We can’t afford to keep Randy Hultgren and Peter Roskam in office any longer. They continue to waste our taxpayer money in vain attempts, 42 at last count, to end the Affordable Care Act. Each Hultgren and Roskam attempt to defund the law, which was enacted by Congress and upheld by the Supreme Court, costs us taxpayers (according to research by CBS) approximately $1.45 million. Hultgren and Roskam join with the rest of the House Republicans in collectively spending 15% of its activity since 2011 on repealing the ACA (Obamacare), or about $17 million in Congressional Republican salaries– according to a recent report published by the New York Times. When considering all the facts, it becomes quite clear that the Republican temper-tantrum over the ACA is nothing more than them serving the financial services industry–their primary campaign donors–rather than any concern about American people. For a politician claiming to value fiscal responsibility, 14th Congressional Representative Randy Hultgren certainly has wasted a lot of our money. Hultgren has voted with the rest of his Tea Party coalition to repeal Obamacare 40 times. According to a recent CBS study, each Republican vote to repeal costs all of us American taxpayers $1.45 million—for a total of about $58 million. Question: Why would Hultgren be so focused on wasting our money to repeal a law voted in by Congress and upheld by the Supreme Court? Answer: Hultgren’s largest campaign donors come from the Securities and Investment (i.e. Insurance) industry. Check it out at OpenSecrets.org. Hultgren is protecting Insurance CEO’s paychecks at the same time he is attempting to take insurance coverage away from those who need it and billing American taxpayers millions for his efforts. Question: So what’s so bad about Obamacare that the financial services industry wants to repeal it? After all, Obamacare just delivered millions more people into their coffers. Answer: Obamacare restricts the profit insurance companies can make. PDA IL: Dr. Quentin Young on the future of single payer and building a strong progressive movement. National Coordinator of Physicians for a National Health Program and newest member of Progressive Democrats of America’s Advisory Board, speaks to PDA IL on the future of single payer and building a strong progressive movement. As the corporate media covers every move made by Republican presidential contender Mitt Romney and Democratic incumbent Barack Obama, we go to Baltimore to cover the Green Party 2012 National Convention. “We need big solutions, you know, not solutions around the margins. We really need to end unemployment, we need to put 25 million people back to work with good paying jobs,” says presumptive presidential nominee Dr. Jill Stein, who is running on a platform called “the Green New Deal” that emphasizes economic justice, tough financial regulation, the repeal of Citizens United and a transition to a “green economy.” The Green Party expects to be on the 2012 ballot in at least 45 states and plans to spend approximately $1 million on its campaign. Stein is the party’s first candidate to independently qualify for federal matching funds, a milestone for this 11-year-old third party. It was early in the morning and I was late for an appointment. But it was my brother calling, so I answered my cell.